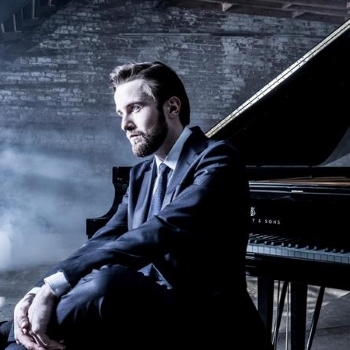 The music of Rachmaninov has formed a significant part of Daniil Trifonov's recorded repertoire, especially a previous account of the Rhapsody on a Theme of Paganini alongside variations on themes by Corelli and Chopin. Now he turns his attention to the concertos: entitled "Destination Rachmaninov: Departure" and reuniting Trifonov with his Rhapsody partners (the Philadelphia Orchestra and Yannick Nézet-Séguin), this first instalment pairs the Fourth Concerto with perhaps that most famous of all piano concertos, namely the Second. What can one say about what must be one of the more frequently performed works in the concerto repertoire? Well, if you’re Daniil Trifonov then the answer is “quite a lot”. Whilst acknowledging the piece's stylistic departure (alluded to by the album's title) into the more lyrical style of writing for which Rachmaninov has become known, both Trifonov and Nézet-Séguin seem pleasingly keen to avoid any hint of wallowing self-indulgence, and what comes across is the amount of detail there is, both in the piano part but also in the orchestral writing. Every string entry is there to be heard without being distracting, and small interjections from trumpet and horn cut through to just the right amount. Moreover, Trifonov brings a marvellous clarity to the dozens of rapid left-hand notes that accompany a lot of the melodies. They’re never laboured but each note comes across beautifully, enabling Trifonov to highlight the rhythmic intricacies of the piano writing that don’t necessarily make themselves felt in many other recordings. Equally, however, Trifonov and co are happy to linger where the music needs it, particularly towards the end of the first movement, where after expressive contributions from solo horn and cellos, the gradual feeling of winding down before the final push to the end is perfectly timed, with Trifonov taking what feels like an outrageous amount of time to place all of his grace notes before the first violins come back in again. This stretching makes the final dash to the end of the movement even more thrilling. This rhythmic observance carries through into the second movement, where the off-kilter device of grouping the piano’s triplet quavers into three groups of four rather than four groups of three plays off against the flute solo and avoids any hint of routine about the performance. This is followed by a most exquisitely-shaped clarinet solo, full of sentiment but in no way cloying. Nézet-Séguin makes the most of every expressive crescendo and diminuendo, and when the “big tune” comes back for the final time just before the very end, he deploys a pleasing amount of freedom, satisfyingly delaying the occasional chord and allowing some juicy horn harmonies to come through nicely. After a dazzling performance of Rachmaninov's transcription of three movements from Bach's Violin Partita No. 3 (BWV1006), in which Trifonov again displays crystal clarity when it comes to bringing out the inner parts of Rachmaninov's piano writing, he then turns his attention to the Fourth Concerto. Although still recognisable as being by Rachmaninov, this work bears the unmistakeable influence of Gershwin and the jazz music to which he had been exposed whilst living in the US, not only in terms of the more scrunchy harmonies employed but also in the syncopated rhythms that underpin melodies. There are moments where in Trifonov’s hands it feels as if he is about to break out into Rhapsody in Blue! The orchestration in this concerto is also much more adventurous than the earlier piece, and Nézet-Séguin takes care to highlight small details such as fast repeated trumpet quavers and some high-lying bassoon writing, for instance. It's fascinating to hear the piece side-by-side with the Second Concerto, and makes me impatient to discover what wonders Trifonov will work with the remaining concertos in the future!